Madison City Hall is located at 210 Martin Luther King Jr. Boulevard, Madison WI 53703; phone: 608-266-4611. Photo: Eugene A. Gilmore House, ca. 1908, 120 Ely Place, Madison, WI. 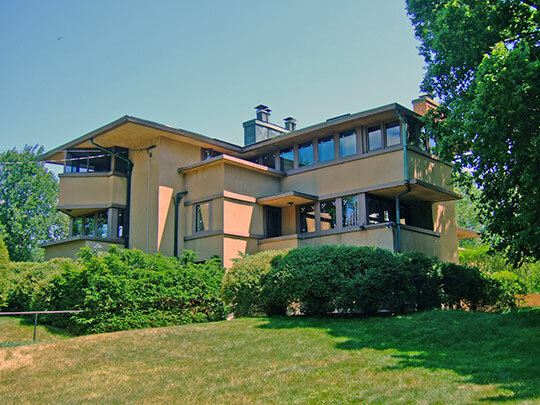 Known as the "Airplane House," this Prairie Style home was designed by Frank Lloyd Wright. Listed on the National Register of Historic Places in 1973. Photographed by user:James Steakley (own work), 2009, [cc-by-3.0 (creativecommons.org/licenses/by/3.0)], via Wikimedia Commons, accessed Auguse, 2013. One of only a few cities in the world built on an isthmus, downtown Madison is set on a narrow strip of land between two glacial lakes — Lake Mendota and Lake Monona. The city is named for former President James Madison and the downtown streets surrounding the Wisconsin State Capitol are named for the 39 signers of the U.S. Constitution. Madison is a recreational paradise with five area lakes, 120 miles of bike trails and 260 parks. Many major thoroughfares have special lanes reserved for bicycles A one-mile pedestrian mall, the famed State Street, links the Capitol Square to the beautiful lakeside campus of the University of Wisconsin–Madison. The Wisconsin State Capitol is the city's signature landmark. No building within a mile of it may rise higher than the 284-foot white granite dome of the Capitol, which is modeled after our nation's Capitol.